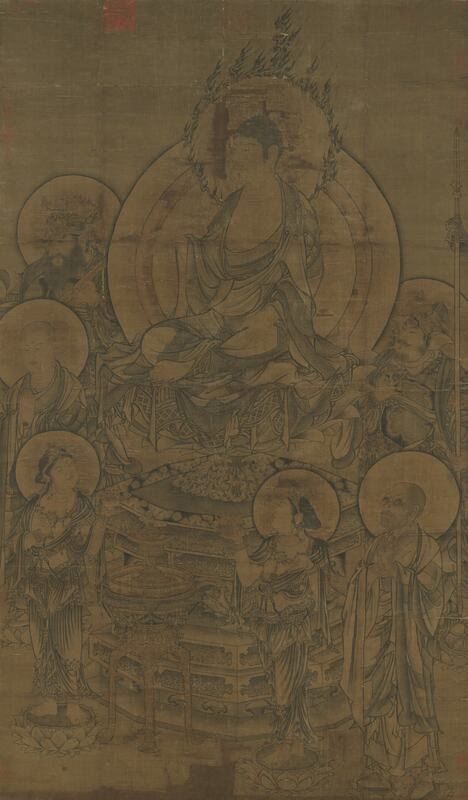 The Buddha, seated with legs crossed on a lotus pedestal, on either side a heavenly king as protectors of the Buddhist law, the great disciples Ananda and Mahakashyapa, and a bodhisattva making offerings. The Buddha has long eyebrows and delicate eyes for a refined yet majestic appearance, while the two heavenly kings wear armor and brandish a sword and lance to convey their fierce martial spirit. The figures in the painting all vary in terms of expression, each of them true to life. In the four corners of this painting are half impressions for the double dragon, "Zhenghe" (connected bead), "Zhenghe," and "Xuanhe" seals. They accord with seals used for the "Xuanhe mounting" style of Emperor Huizong (reigned 1101-1125) and therefore indicate it was once in his collection. The swelling forms of the bodhisattva figures and the ink shading to the drapery lines are vestiges of the late Tang dynasty (618-907) style. The indistinct "ushnisha" (head protuberance) of the Buddha and the small mark on the forehead are features of Song Buddha figures, suggesting this scroll was painted in the early part of the dynasty.